So you want to get Android Auto in your car but you have no idea where to start. That’s okay: I spent two weeks riding around in various automobiles with Google’s new in-car software to help you with this very thing. I even spent time with Google’s Daniel Holle, Product Manager on Android Auto, to find out more about the inner workings of the software. Android Auto is simple and safe to use—the hard part is figuring out how to get it into you car. Pioneer is one of the first manufacturers to offer after-market receivers with Android Auto. Google doesn’t expect you to go out and buy a new car just to have access to Android Auto. Brands like Pioneer, Alpine, Clarion, and JVC/Kenwood are already a part of the Open Automotive Alliance, so you can at least pay to have your dashboard system upgraded. Pioneer is the first aftermarket car stereo manufacturer to actually offer a specific line of receivers that support Android Auto. You can check to see if the NEX line is compatible with your vehicle at Pioneer’s website. Of course, you’ll have to factor in the price of the receiver unit, as well as the cost of labor to have it installed in your car, but the upgrade may be worth it for the functionality in the long run. If your car manufacturer isn’t a part of the Open Automotive Alliance assembled last year, then you might be out of luck. Toyota, BMW, and Mercedes-Benz are among some of the more prominent manufacturers conspicuously missing from the list, likely because they’ve already invested heavily in their own systems. Bear in mind that this could change in the years to come. Android Auto isn’t just meant to help you control your music or navigate around town—its mission is also to help you keep your eyes on the road and off your phone. Google built Android Auto so that it complies with recognized automobile safety standards, including the National Highway Traffic Safety Administration's (NHTSA). “The big idea behind this is we’re making the drive a lot safer,” Holle said during an Android Auto demo at Google headquarters in Mountain View. “Right now, you won’t find an app launcher because we want to be really smart about not overwhelming the user. We want to be really smart about what kind of use cases are available in the car.” That's one reason why, while your phone is tethered to your car to run your Android Auto experience, the phone itself is unusable. Going somewhere? Google Now has you covered. Google Now is essentially the home base for Android Auto. Important Cards will pop up as you need them, but never too many at a time, so as to avoid driving distractions. And your car won't show you cards that have nothing at all to do with information you'd need in a car. If Google knows you’re going on a trip, for instance, it might automatically pop up directions to the airport once you get into the car. Or, if you’re on your way to a new town, Android Auto will display the weather at your destination. You can navigate, but you can’t read text messages. Instead, Android Auto will dictate everything to you. For Android Auto to be safe for drivers, it has to eliminate any major distractions. As a result, Android Auto has a very limited selection of touchscreen action buttons. You control the interface primarily through voice. For instance, if you want to send a text message, you’ll have to dictate it out loud. When you receive a reply, Android Auto will in turn read it to you. There is an onscreen keyboard available in Android Auto, but only when the car is parked. You can use it to input an address, for instance, but once the car is ready to drive, the keyboard option disappears. Android Auto currently supports a limited number of text messaging applications, including Hangouts, Google Messages, and Kik. You can view the full list of supported Android Auto apps in the Google Play Store. More are on the way as developers update their apps. Android Auto relies heavily on your phone to work, but once you plug in your device it’s rendered inoperable. The whole point is to keep you from using any applications on your phone while you’re driving. Anyway, you don’t really need to check your Instagram feed while you’re driving, do you? Any app made compatible with Android Auto has to be vetted by Google vefore it goes live. You’ll need the Android Auto app to run Android Auto. After you get Android Auto installed in your car, you’ll need a phone running Android 5.0 or better. Then, you’ll need to download Android Auto from the Google Play Store. Once that’s all set up, you’ll have to plug in the phone with a MicroUSB cable. Android Auto doesn’t yet support Bluetooth or Wi-Fi direct, though the latter is hopefully coming soon. Some popular Android phones don’t yet work with Android Auto, either. 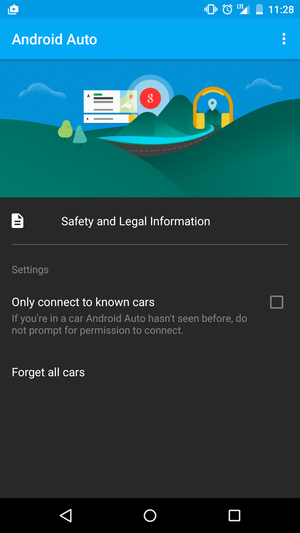 The best part of Android Auto is that everything stays tied to your phone, including your music, your personal details, and the places you travel to the most. No data is stored internally on the receiver in your car. Updates are delivered to the apps on your phone, too, so as long as your phone stays up to date, so does Android Auto. This is actually a bummer for those of us who still like things analog—I, for one, enjoy whacky local morning shows. 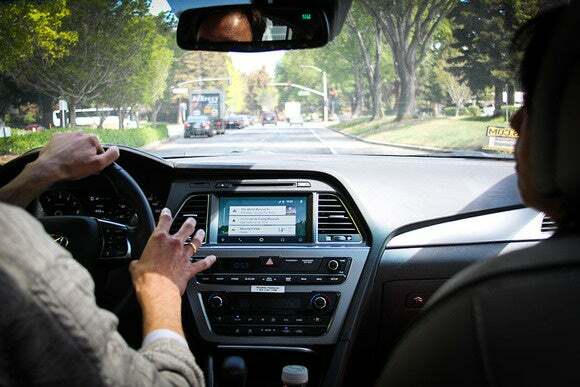 Android Auto can’t control your AM/FM or satellite radio, nor does it control the locks in your car or the air conditioning because it’s primarily focused on delivering the features you use most on your phone in a manner that isn’t distracting to your driving.